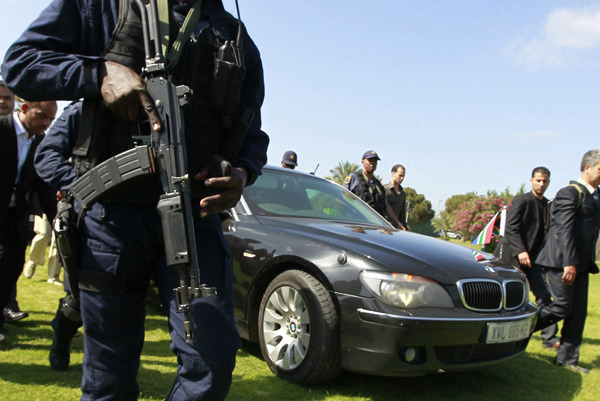 The VIP Protection Unit is an arm of the South African Police Service responsible for the transportation of the president, deputy president, cabinet ministers and MECs. In recent years it has drawn criticism for its bullying tactics on the road. 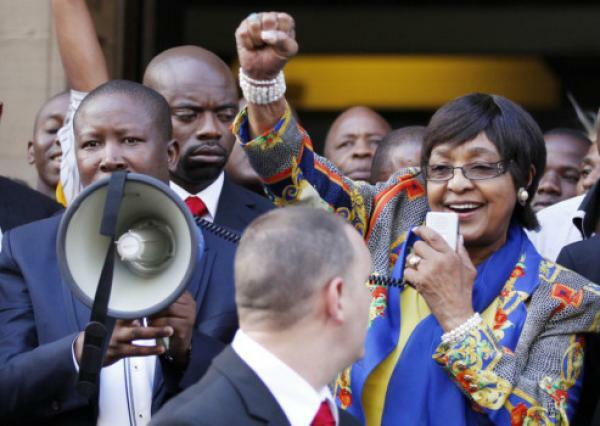 It came to particular prominence in January 2009 following its alleged assault of a civilian who came too close to South African President Kgalema Motlanthe's vehicle cavalcade. 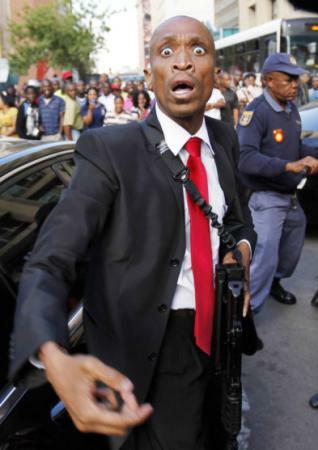 A group of armed men stormed into a South African hotel lobby with guns drawn, terrifying everyone out of their wits. 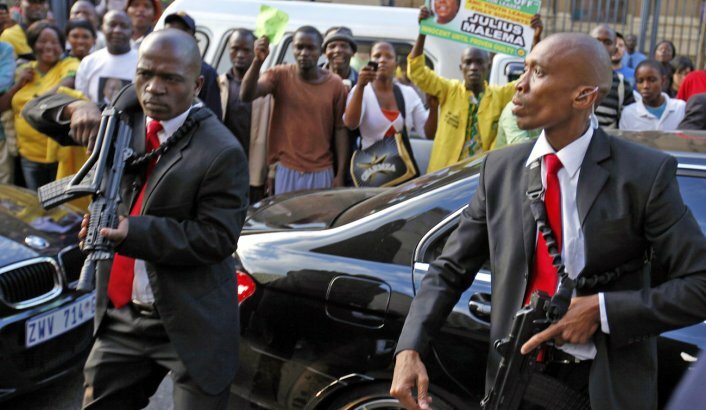 However these gun-toting men merely were the 'armed protection unit' for South African acting vice-president Baleka Mbeti. Staffers and guests immediate raised the alarm with local police and the hotel's private security unit - believing they were being attacked by a large robber gang. This is understable: the country suffers from the largest number of armed robberies in the world. When guests discovered who these men really were, they all launched into an angry against the armed VIP protection unit -- and also against 'arrogant politicians and their high-speed blue light motorcades' endangering road users countrywide. 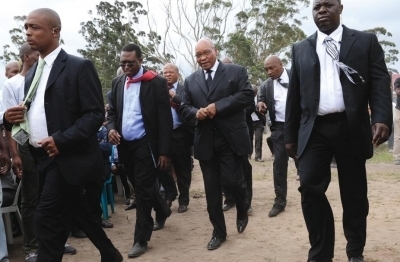 Recently, one such blue-light motorcade carrying African National Congress party president Jacob Zuma killed a pedestrian. They did not stop. One hotel guest who spoke to Digital Journal shortly after the incident from Nelspruit said 'we are already so sick and tired of the country's politicians terrifying everyone with their arrogant behaviour on the roads. And then they come storming in here and scare us out of our wits in a hotel lobby, too'. 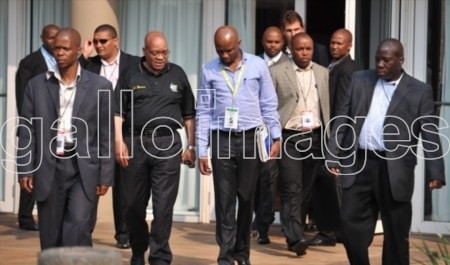 The entire ANC-leadership has over the past five years, been taking to the roads in high-speed, no-holds-barred 'blue light' motorcades, often 20 cars or more with heavily armed VIP police protection units - who are drawn from regular police units which fight daily battles against the world's most violent crime rate. And the hotel guests aren't the only ones who are irate about this. 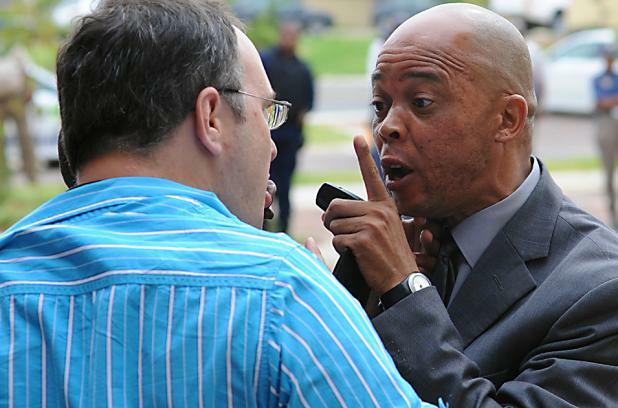 Many South African citizens said that they are become increasingly irate at the arrogance of the VIP cop units. In this lobby of the City Lodge Road Hotel in Nelspruit, guests were scared out of their wits when a large number of armed men stormed in, guns at the ready. 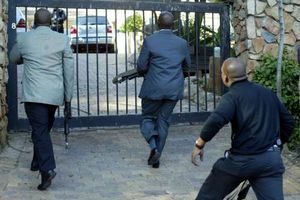 They turned out to be the VIP protection unit for the country's Vice President, who had arrived in a high-speed bluelight motorcade to have a chat with local FIFA World Cup 2010 organisers. The hotel guests were furious. "People in the lobby were frightened out of their wits when this huge group of men burst in, guns drawn,' he said. 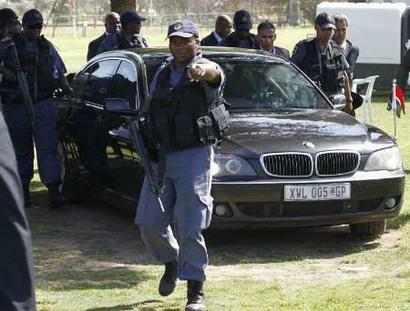 The country's acting vice president, Mbeti showed up at the Town Road Lodge in Nelspruit accompanied by this large blue-light motorcade and the armed contingent of VIP-Armed Protection Unit cops - merely to hold some talks with the city's team coordinating World Cup 2010 football cup tournaments in the town. City Lodge Hotels district manager Clifford Ross also confirmed that there had been a 'verbal disagreement' between the guests and the armed VIP unit. However he wasn't at the scene, and tried to put a brave face on the incident. "It was brief and sorted out quickly,' he claimed. 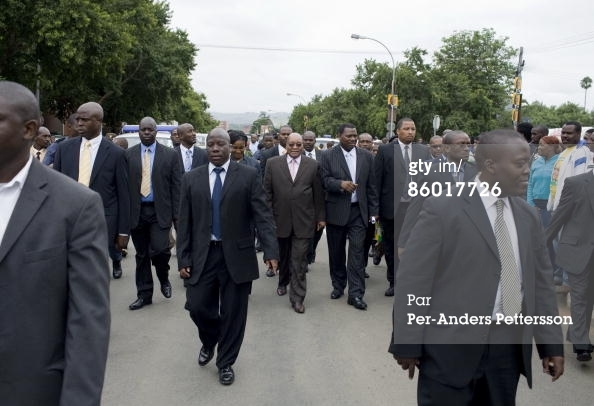 The new head office for the South African Police Services VIP Protection unit was developed in Sunnyside Pretoria. The site is enclosed by Beatrix, Hammilton and Park streets. The project was developed by a joint venture consisting of Abland and Midcity property developments. The building consists of 22 000m² of office space with two levels of basement parking. The structure is a conventional 255mm thick conventional reinforced concrete slab. The finite element method was used to optimize the design. The Close Protector provides close protection to identified very important persons (VIP’s) by physically protecting them on foot and in transito. Other functions include planning of operations, communication with VIP’s and delegates, maintaining equipment and recording of procedures. 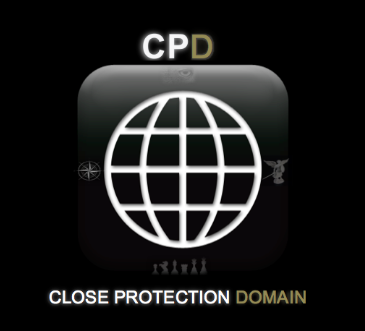 What are the minimum requirements to become a Close Protector? 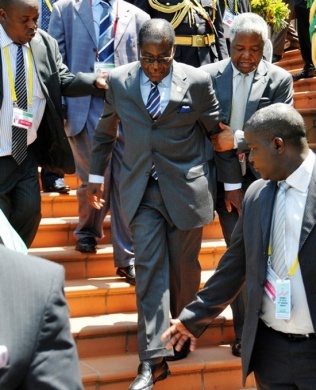 You must have done Basic Police Training, Basic VIP-Protection Course and Identification of Explosives Course. Experience as Static Protector for at least one year and one year driving experience (advanced driving K53 and State Authority) is also necessary. You must also be able to swim at least 25 metres. Advances VIP-Protection Course, C.A.T Training, Protective Intelligence Course, Risk Management, Security Advisory, Communication and Liaison, Technical Support Training, Explosive/ Dog Handlers Course and Advanced VIP-Protection Course. 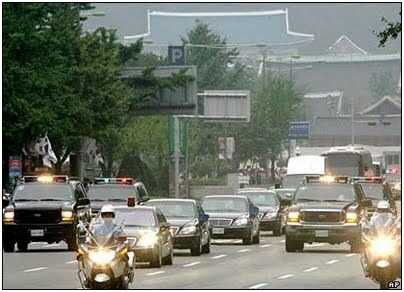 Presidential Protection Unit and VIP Units on Provincial and National Level. 11 weeks of intensive combat training, shooting and driving courses, physical training (both offensive and defensive), lectures on protocol, self-management classes (which includes the handling of stress) as well as courses on explosives and chemical threats. 140-160 members start the course with only around 10-20 on parade who will have completed it. The members who make it then move on to complete three months of field training before becoming fully fledged members of Protection Services.